SUPER-CUT applies our extensive expertise in automotive glass processing to flat and solar glass markets. We offer precision engineered grinding tools that meet the unique quality and performance requirements of each industry, with solutions tailored to your specific application requirements. Let a SUPER-CUT sales engineer help you find the most effective and efficient solution to your glass processing challenges. As the demand for flat glass in the construction market continues to grow, SUPER-CUT can help you achieve high-speed, low-cost fabrication with our wide range of engineered grinding products designed for flat glass processing applications. We offer cutting, edging and polishing tools that produce high-quality finished edges on architectural glass used as glass doors, windows, office partitions, tables, shelves, mirrors and transparent walls. SUPER-CUT grinding products are key to meeting the glass processing challenges of new applications in the solar industry. Our diamond wheels, drills and dressing sticks improve performance and productivity in the processing of specialty glass used in solar energy applications, including low iron, mirrored, patterned and coated glass. SUPER-CUT offers various types of scoring wheels to effectively produce the desired shape with the least amount of edge damage. TIP: Always check the depth of the score when you start up a new cutting wheel. The depth of the hackle should be 10-15% of the thickness of the glass you are cutting. Always remember the speed equals force. So the faster you cut, the deeper you drive the score and vent into the glass. This photo illustrates a good score. For flat glass operations, SUPER-CUT offers dependable, low-cost carbide cutting wheels. SUPER-CUT carbide cutting wheels are available pre-assembled or as separate components. Our pre-assembled wheel, axle and insert save valuable line operator assembly time, increasing your productivity. SUPER-CUT also offers carbide cutting wheels for float operations. These carbide cutting wheels can be used dry or with cutting oil. See below for information on SUPER-CUT Coolants. Peripheral wheels with SUPER-CUT diamond/bond specifications are designed to deliver. Embedded in a sintered metal matrix, our wheels are offered with segmented or continuous diamond sections. These long-lasting wheels are best suited for rough grinding with coarser diamonds for higher material removal. The SUPER-CUT Advantage: Wear resistance results in higher material removal rate, high grinding efficiency and longer service life. Superior non-load bond systems draw fewer amps and require less stoning. Resin bonded wheels are best suited for edge and arris finish grinding. They are ideal for final stage grinding before a high lustrous polish. Engineered for long life, they are able to run at high speeds to produce high quality luster and require low spindle amperage. Available by position and machine. Please specify when ordering. The SUPER-CUT Advantage: The continuous self-sharpening property of high-quality diamonds produces smooth, chip-free edges and corners. Improve the yields off your beveller with SUPER-CUT Resin Bond wheels. Peripheral wheels, with diamond section mounted at the periphery, are designed to meet flat or shape grinding. The SUPER-CUT Advantage: Fast startup, perfect for short run. Longer form retention giving you better yields and longer runs, translating into higher productivity. SUPER-CUT diamond pencil edging wheels are engineered to your needs. A SUPER-CUT edge will offer you the smoothest surface from the grind that you can find. When polishing the edge in flat glass applications, the easiest way to improve the polish is to make sure you have a perfect grind. Best practice is to use a Position One – coarse grind, followed by a Position Two – fine grinding wheel. This will make it very easy to polish – Position Three. In consumer product applications, the appearance of the visible ground edge is critical. This often requires a special profile with multiple radius, blended to a complex shape. SUPER-CUT EDM profiles will give you the exact shape you design. Learn more about our Wheel and Drill Reprofiling services. Our one-piece straight core drills offer fast performance and amazing life, in sizes from 4 mm to 180 mm OD. In sizes under 25 mm, SUPER-CUT straight core drills have been known to drill more than 40,000 holes. SUPER-CUT can fit any drilling machine on the market today. Shank design will be selected to fit your equipment. Need to finish a cut-out or shaped opening? SUPER-CUT has the seamer, pencil edge or router to give your finished product the exact look required for today’s stove top designs. Are you cutting this shape with a water-jet? As a major abrasives company, SUPER-CUT can offer you the garnet abrasive required to cut glass or ceramics. Are you interested in improving oven yields? Try a SUPER-CUT chamfer drill bit instead of a straight core drill bit. We have live case studies of improving oven yields up to 12%! A relatively softer abrasive is used to provide greater diamond exposure. TIP: SUPER-CUT carries longer, 230 mm dressing sticks made especially for hand-dressing your diamond grinding wheel. SUPER-CUT diamond pencil edging wheels are engineered to meet the requirements for glass used in solar panels. 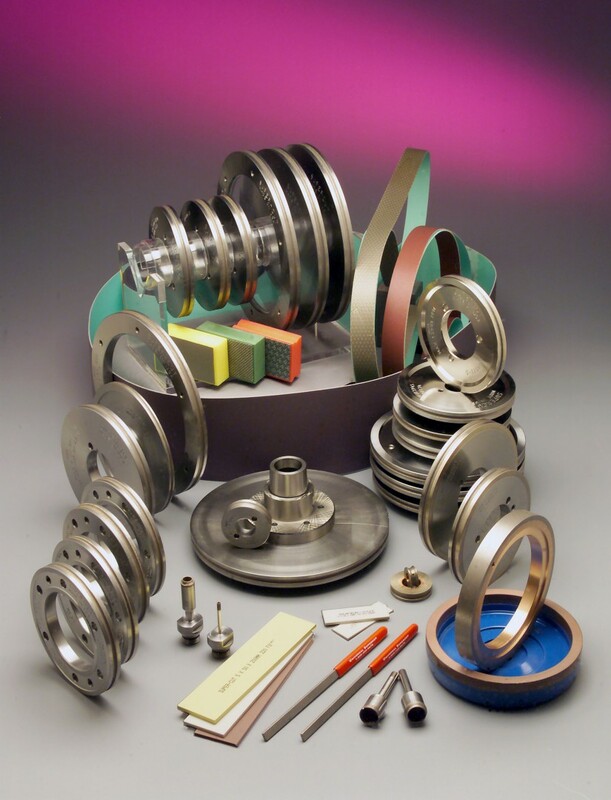 We manufacture pencil edging wheels for all straight line machines, double edgers and CNC grinders. Our new technologies enable us to offer wheels with free cutting for low edge stress and a longer life bond. In solar panel applications, the appearance of the visible ground edge is critical. This often requires a special profile with multiple radius, blended to a complex shape. SUPER-CUT EDM profiles will give you the exact shape you design. Learn more about our Wheel and Drill Reprofiling services. We can design a custom OD exactly for your equipment and grinding needs with wheel OD as small as 25 mm and no restrictions on the OD of the grinding wheel. SUPER-CUT’s one-piece chamfer drills are designed to drill and chamfer holes in a single cycle. The fixed core lengths are set for each glass thickness to provide optimum drill speed and hole quality. The one-piece core drill seamer is the most commonly used drill in glass today due to its ease of use and excellent hole quality, resulting in high glass yields in the tempering process. Consult a SUPER-CUT sales engineer for a size and specification recommendation. TIP: Are you interested in improving oven yields or the strength of the glass? Try a SUPER-CUT dual mesh chamfer drill bit to achieve high line speeds with faster drill time and great hole quality.